On the Internet, there are two kinds of search results: paid and organic search. So, when you ask a search engine a question, both of these types of results will appear. 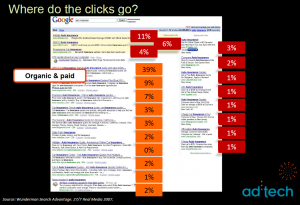 How do you tell the difference between paid and organic search? Well, keep reading to find out. First we need to talk about searching in general. The whole point of having a website is to get people to visit it. To get your site noticed, you need to rank high in searches engines like Google and Yahoo. Companies that get to the top of a Google search, also known as the search engine result page, can do two things. These companies can use paid and organic search. Paid search are results from advertising agencies at the top of the search results page. These ads are usually highlighted in a different color from the rest of the page. Organic searches make it to the top of the search results page from the search engine’s algorithm. This means that these sites have good SEO and generate a lot of traffic. These are both great ways to get people to visit your site, but there are pros and cons. One pro to organic searches is that it is much easier to keep a ranking in the search engines — it also builds an audience for your website. Also, organic search results make your website more credible than paid ads (the paid searches), which only require payment to get on top. The cons are time and resources. It takes a lot of time to get the top of Google search results. If your site’s SEO isn’t good, you won’t get on top. As for resources, with all of the effort you use to get to the top of Google with good SEO, it might not even work. It is extremely frustrating to write a lot of content and not have it go anywhere. As for paid search, the pro is time. If you pay for a ranking, you know you’ll be number one right away. The cons are cost and distrust. For one thing, it costs a lot to get on top of the search engine results. Also people have a strong distrust for ads — they’re less likely to click your ad than an organic result. So, these are to two ways to gain an audience and generate traffic to your website. There are pros and cons to both paid and organic searches, but you should look into both. « Why E-Commerce is Important	» What is User Interface?